Most particle physics experiments are looking for extremely small particles that both exist naturally and are produced in high energy physics labs, for experimental purposes, around the globe. The sensitive detectors of the Soudan Underground Physics Lab study these particles. Naturally produced particles from around our galaxy constantly bombard the Earth's surface. These particles, sometimes referred to as cosmic rays, would overload a detector if placed on the surface. By the time these particles reach the Earth’s surface they have become mostly muons, electrons, positrons, and gamma rays. Most cosmic rays cannot travel very far through rock. 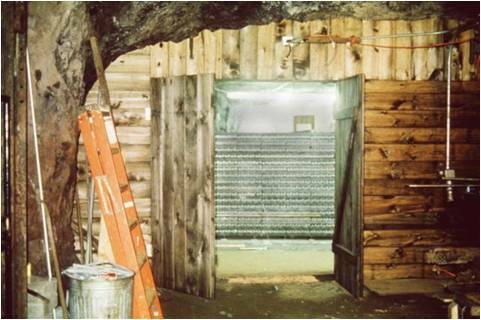 If the detectors are located underground, most of the cosmic rays are blocked by the rock. On the surface, a detector the size of your hand would detect about 2 muons per second. Down in the lab, ½ mile underground, that same detector would detect only 2 muons per week. 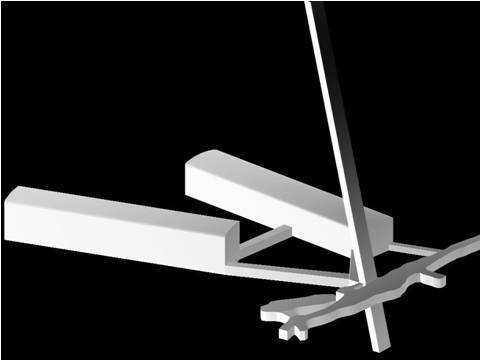 The image above is a rendering of the underground labs: the angled shaft leads down to the two detector caverns. In 1980, Marvin Marshak, a physicist from the University Of Minnesota, was looking for a location to set up an apparatus to detect the decay of protons, an event which no one had ever observed before (nor has anyone yet). The apparatus was designed to detect the particles that would be produced when a proton decays. These same particles are produced in other radioactive decay, including reactions occuring inside the sun. These particles constantly shower the Earth's surface, as a result the detector needed a place that was protected from these background particles. Marshak took the Soudan Mine Historic tour and thought that the Soudan Mine would be the perfect place. It was deep: therefore, few background particles could reach down to the lab. It was safe: there was no blasting from an active iron mine. And yet, it still had a functional elevator and pump system because it was a historic site. The first experiment was Soudan 1, Pictured left in the 23rd level drift. It became apparent that the detector was not sensitive enough. So Soudan 1 paved the way for the Soudan 2 experiment which would run from 1989 to 2001. 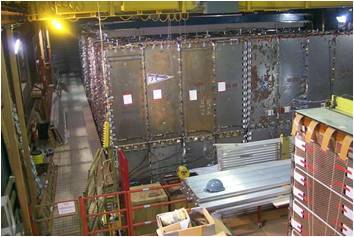 The Soudan 2 detector (pictured left) was built in 1986 to attempt to observe proton decay and was tuned to observe other particle activities. Scientists were motivated to search for proton decay because certain proposed Grand Unified Theories of Physics postulate that a proton could decay, that is break into other particles. Additionally neutrons, the proton's neutral cousin, had been previously observed to decay. It was expected that proton decay would be analogous. While Soudan 2 never observed a decaying proton, as a result of the data gathered scientists were able to place a lower limit on a proton’s half life. That is they discovered the minimum amount of time required for a proton to begin to break into smaller particles, a proton’s half life, is at least 6x10^32 years, that’s 6 followed by 32 zeros! In the 11 years the experiment ran about 500 of the atmospheric neutrinos that traveled the ½ mile through the Earth’s surface were observed in the Soudan 2 detector. The neutrino data that were collected prompted further investigation of neutrino oscillation and helped pave the way for the MINOS experiment currently running in a neighboring cavern.